There are many good reasons to translate your WordPress website. It opens up new markets and brings in additional customers. After all, while a little more than a quarter of the Internet speaks English as a primary language, the other three quarters do not. For that reason, if your site is only in one language, you are missing out on a ton of people. In addition to that, the online access in English-speaking countries is already relatively high and will bring less people online. At the same time, other languages, especially Chinese and Arabic but also Spanish, Portuguese and other languages are constantly adding new Internet users. Apart from that, being able to get product information in their mother tongue is a huge factor in purchasing decisions for consumers. If that isn’t enough to add additional languages to your site, I don’t know what is. 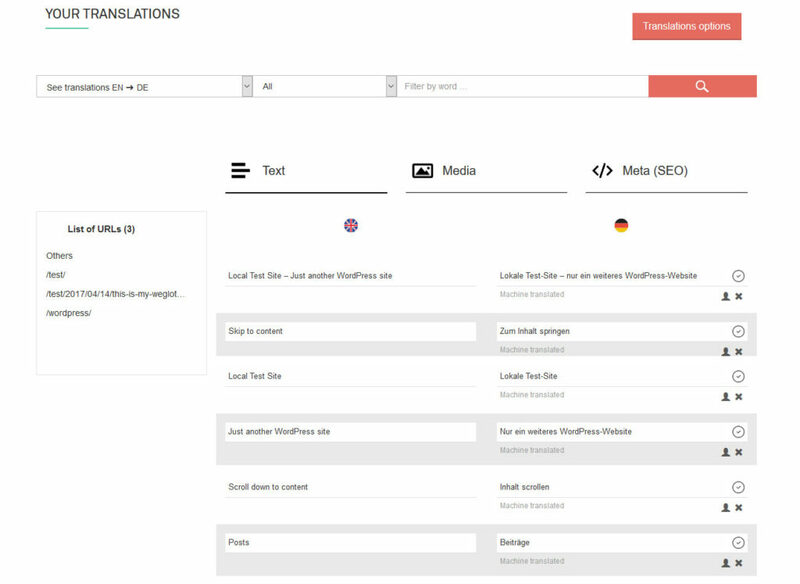 WordPress already offers several translation solutions, which we talked about here and here. However, a new player recently joined the arena. 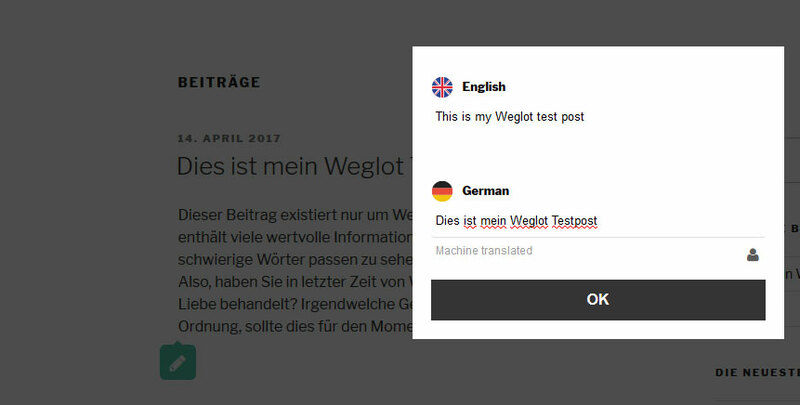 Weglot, a freemium translation plugin for WordPress and other website solutions is making waves. 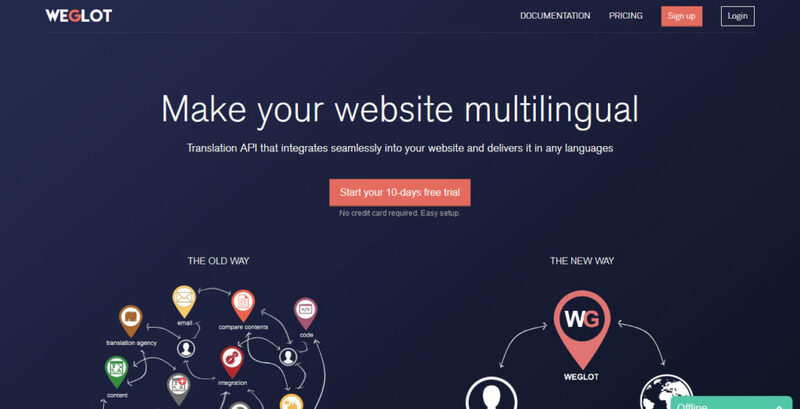 Unlike most other solutions, Weglot is Software as a Service approach to translating websites. Reason enough for us to take a detailed look. In our following Weglot review, we will tell you how the service works and talk about its strengths and weaknesses. Weglot automatically translates your content into more than 60 languages and gives you the possibility to edit and refine the translations manually. To give you a better impression of how this works in practice, let’s go over a the whole process once. The first step is to install the free plugin from the WordPress directory. You can do this as usual under Plugins > Add New or by downloading and installing it manually. Next up, you need a Weglot account. You can create one on the Weglot website. Just click on red button in the middle of the screen. In the next screen, enter a valid email address and a password of your choice twice. After that, check your emails and click on the confirmation link. Boom, you’re done. 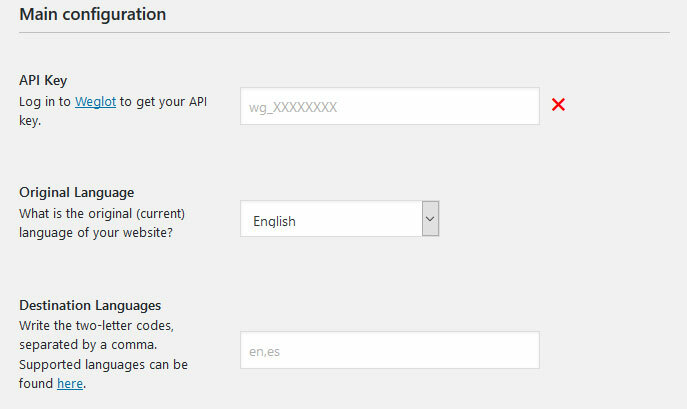 Confirming your account also gives you the API key that needs to be input in the Weglot settings. This is our next stop anyway and you can find them under Weglot in the WordPress sidebar. Copy the API key to the appropriate field. This will connect your site to the Weglot service. After that, pick the original language of your site and the target language of your translation. Target languages are input as two-letter codes that you can find here. You can add several languages divided by commas. However, note that this is only available for paid accounts, not the free trial. Pretty clear, right? If you are not entirely satisfied, you can even use custom CSS. If you don’t choose any option, the language switcher will automatically be displayed at the bottom right of the page. Besides that, it’s also possible to exclude URLs and CSS selectors (for example .footer) from being translated. That way, you can keep information that doesn’t need to be transferred into another language as is. That’s it for configuration, now let’s see how things work on the frontend. Now we will come to the actual translation. For that, we need to turn to your site. Here’s my example site with some English test content. You will also notice the language switcher in the corner. When I now switch to my target language German, we get this. As you can see, all the content, including the strings in my sidebar and the date format, have been translated. Pretty neat, right? The best part: the page also got its own URL including a language prefix. That means, it went from http://mysite.com/ to http://mysite.com/de. The advantage: it can now be indexed as a standalone page which greatly benefits your SEO. For Google, you now have an localized version of your page online. And it only took a minute or so to achieve this. However, German speakers (such as myself) will notice that the machine-translated version of my content leaves much to be desired. So, let’s turn to making corrections now. Weglot gives you the options to improve and fine tune your copy inside the dashboard of your account. Here, you also see the status of your translations, how many words you are using, the amount of human translation and number of languages. Further below, you have to option to change translations, either using a visual editor to change text directly on your website or by editing an index of your translated text. Let’s start with the visual editor. When you click on this option, you get taken to a live version of your site. To edit any of the text, just click on it. Doing so will take you to this window. Here, you can make edits or even order a professional translation right from the interface. Easy peasy. Not only can you search it for certain words but also edit content as well as media names and meta information. The index will also tell you which parts are machine translated, which by humans. You can also mark accurate translations as reviewed so you don’t lose track of what is already up to snuff. Finally, search and replace makes quick work out of multiple edits. All the changes you make either way will automatically be applied to your site. Very comfortable. You also have the option to pay yearly, which gives you two months of free service. In addition to that, every plan also gives you access to professional translators at 0.08€/word. So far so easy. So should you get Weglot? Let’s discuss some pros and cons. As we have seen from the above, setting up Weglot literally takes a few minutes. I could hardly imagine an easier system. Plus, while the automatic translations are not one hundred percent correct, they give you a good basis to start from and a head start in contrast to a fully-manual approach. Weglot follows Google’s best practices when it comes to multi-language websites and SEO. You don’t need additional plugins to get your content indexed, everything is done pretty much automatically. What more can you want? Other translation plugins out there are often criticized for slowing down websites. This is not the case with Weglot. Everything is generated quickly and dynamically. Support is very important, especially for first timers. Weglot comes detailed instructions on how to get started. They also offer live chat support within business hours or otherwise the possibility to email them or use the WordPress support forums. I personally would have also liked an FAQ section. The reason why FAQs would be useful is because I was looking for an answer as to the ownership of the translations. Since everything is happening on their website, do you lose all the translations with the end of your subscription? Or is there a way to export them? Information on this part would be useful. Of course, the price can also be a hindrance as Weglot is not cheap. Sure, you get a lot out of it but you need to have the budget. For example, $195 gets you a lifetime license for WPML that you can use on unlimited sites and for unlimited languages. In contrast to that, the same money only gives you a year on the Business plan which is basically for one website. Weglot is an interesting new contender on the market for multilingual WordPress plugins. Its ease of use is phenomenal. The service makes quick work out of translating websites and is much more comfortable than other solutions out there. Plus, it is SEO friendly and doesn’t slow down your site. One of the downsides, however, is that pure machine translations are rarely reliable. For that reason, especially for important part of your site such as sales pages, putting in additional effort is mandatory. If you don’t speak the target language yourself, that might also mean getting additional (paid) help. At the same time, the automatic translations are an awesome place to start from. The biggest deterrent, however, is the price. As mentioned above, Weglot a bit on the pricier side. While the comfort is worth it, especially for large sites with a lot of translation needs, it is a serious consideration. Yet, if you have the budget, Weglot is definitely worth a serious look. What is your favorite WordPress translation tool? How does it compare to Weglot? Let us know in the comments section below! Und wie funktioniert das innerhalb des DIVI-Editors? Translation – And how does it work within the DIVI editor? Weglot is comptabile with the Divi editor. Actually anything that’s in the web page source code will be translated and editable with Weglot. Does this translation plugin support Bengali language? Not yet, but we’re planning to add it in the coming months. Its really helpful for others who are looking for translate WordPress website. I gone through your blogs its great and valid information. Does that mean WPML does the translation automatically? I thought it only manages the translation and translated content. Hey Stefan, no WPML doesn’t translate your site automatically. You are right about that. I just wanted to juxtapose the costs of Weglot and another popular translation software for WordPress. I don’t have this budget yet, but I’m considering to try. Thanks for posting this. This plugin is great, one question let say that my main site is in English and I want to target Parts of the US and some Spanish speaking countries. The main content should be posted in English and it will translate to Spanish lets say some internal pages? In addition will the URL translate? meaning my site.com/seo-cit/ to site.com/seo-cuidad/ for the Spanish example. Hey Carlos, not as far as I have seen. But let me get the makers to weigh in. Yes the main content should be posted in English and it will be translated in Spanish (note that you can exclude pages to not be translated if needed). For URL translation, Weglot does not offer it yet. However, SEO wise what matters, according to Google, is to have unique dedicated URLs for each version of your page. Based on Google best practices guidelines, you can use subdirectories (/es for example, so it would be site.com/es/seo-cit/ for the Spanish version). 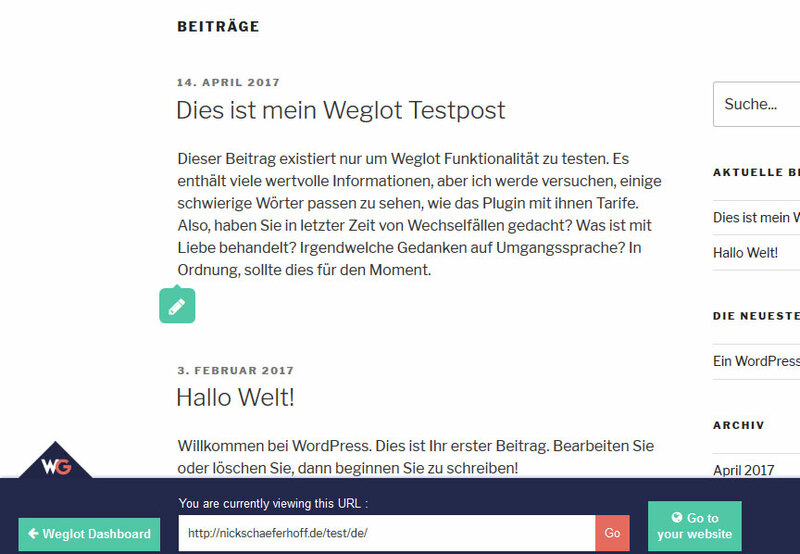 Weglot automatically create the subdirectories for you, for each version of your language. Actually most major tech companies do not translate their URLs, so I believe it does not have a significant impact on SEO (or even has no impact at all). Always great to see a new contender in the WordPress marketplace. This service, albeit easy looking, is way over-priced and hobbles it’s paying users on the basic plan. Only one language for basic paying customers?! Give me a break. I’ll stick with WPML which now works nicely with Divi. Thanks for the input, Kevin! Thanks for your feedback Kevin. I understand Weglot is not cheap but it provides a complete service for website translation. But of course Weglot can not please every one, thanks again for your feedback. I agree completely. I tried Weglot, and it works great, but it’s just way too pricey. I’m back on WPML. My website’s at about 138,000 words right now. $50 a year? that’d be no problem, but $50/month?? Not a chance. I tried using Weglot while searching for an alternative to WPML. It’s quite good though. But the only thing that I don’t dare using it is because of not knowing what will happen in the future. Since every translation is being done and saved on their server. What if someday Weglot stopped doing business for whatever unforeseen problem. We are doomed then! It’s very risky, especially developing for a client’s website. Hey Joey, that’s one of the issues I saw as well (though Weglot seems to be taking off, so there is no fear that they will disappear). This should probably be addressed in an FAQ or somewhere. Thanks Joey for pointing this out :). Hopefully it will not happen. We’re putting all our time and sweat in Weglot, aiming at building the best multilingual service! Actually we just expanded the team, recruiting great talented people, so things are going in the right direction. This is perfect, I’ve been looking for this for quite some time now and there are plenty out there but this one is clean & minimal so will fit into a site I’m working on just now. I’m on the edge of paying a monthly fee if it’s going to be a one off for adding content. I’d happily pay for that if I was writing a blog or something similar, though. Thanks Dan for your feedback! If need anything you know you can contact our support team, either on live chat or via email.